During the past 22 years as a CCM voice faculty member, tenor Thomas Baresel has also been Artist-in-Residence at the Bay View Music Festival, and a visiting faculty member at both Boston University and the Ohio State University. Baresel has also served as faculty coach for the Grandin Festival and co-founded, co-directed and taught voice for Rising Star Singers, Inc. 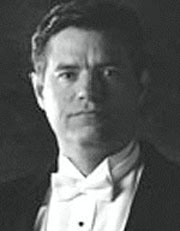 He has performed throughout the United States, Germany, Austria and Japan in opera, operetta, musical theatre, concert and oratorio, and he has been a soloist under the batons of James Conlon, Murray Sidlin and Robert Shaw. Professor Baresel’s students have been and are engaged by the Metropolitan Opera, Seattle Opera, San Francisco Opera, the Wiener Staattsoper and opera companies of Berlin, Stuttgart and Frankfurt, the Glynborne Festival, the English National Opera, Glimmerglass Opera, Opera Omaha, Santa Fe Opera, Wolf Trap Opera, Lyric Opera of Chicago, Chautauqua Opera, Central City Opera, Des Moines Metro Opera, Utah Opera Festival, Sarasota Opera, Michigan Opera Theater,Pittsburgh Opera, Cincinnati Opera, Kentucky Opera, Royal Opera Copenhagen, Wiener Kammeroper, Music Theater of Wichita, Greater Miami Opera, Dayton Opera, Cleveland Opera, the National Symphony, the Cincinnati Pops, Broadway and touring companies of A Light in the Piazza, Phantom of the Opera, Grease, Cats, Little Me, and many other theaters and orchestras in the U.S. and abroad. Baresel is also quite active outside the profession as a Certified Flight Instructor, a USA Swimming Referee and he and his wife, Laura, have competed as amateur ballroom dancers. They have one daughter, Taylor. BM and MM, Wichita State University, Wichita, KS.